It’s an exciting time to be a Phoenician. 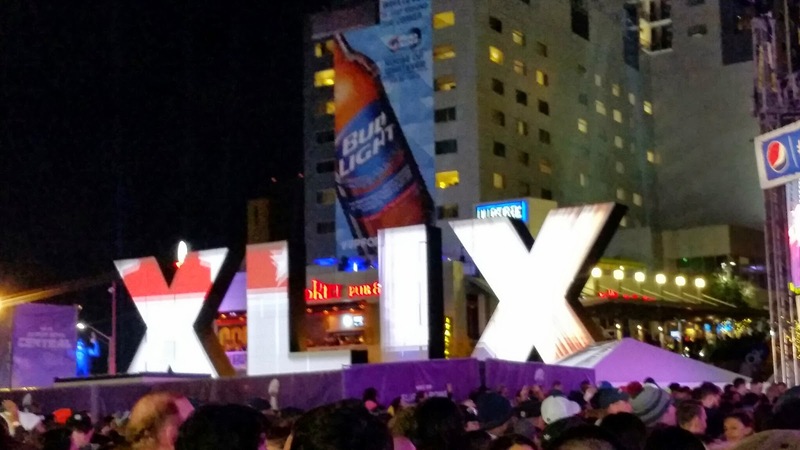 The Super Bowl and the Phoenix Open drew hordes of tourists, and there was no shortage of events for locals to attend as well (if you wanted to shell out the cash). I’m not into spending money to see a celebrity show up to a club past midnight and stay for half an hour (depending on the celebrity), so I opted to attend the free Roots show at Super Bowl Central downtown. The adventure began when Graham and I set off for the light-rail station at Montebello Avenue. We drove up to see a “Lot Full” sign at the parking lot entrance, but we thought maybe we’d get lucky. We saw a car pull out of a space in the last row, and it had another empty space right next to it. The first hurdle was conquered. We scarfed down the last of our personal size pizzas and walked over to the light-rail station. For $8 we had all-day passes to get us down to the madness. A train had just arrived, but we boarded the train that had already been waiting at the station — it was nearly empty. It was soon announced that the operator was on a break and the recently arrived train would be leaving first. We decided to stick it out so we could have a seat rather than ride a packed train. About 30 minutes later, we deboarded at Third and Jefferson streets, in the middle of the brightly lighted Times Square-esque block party. 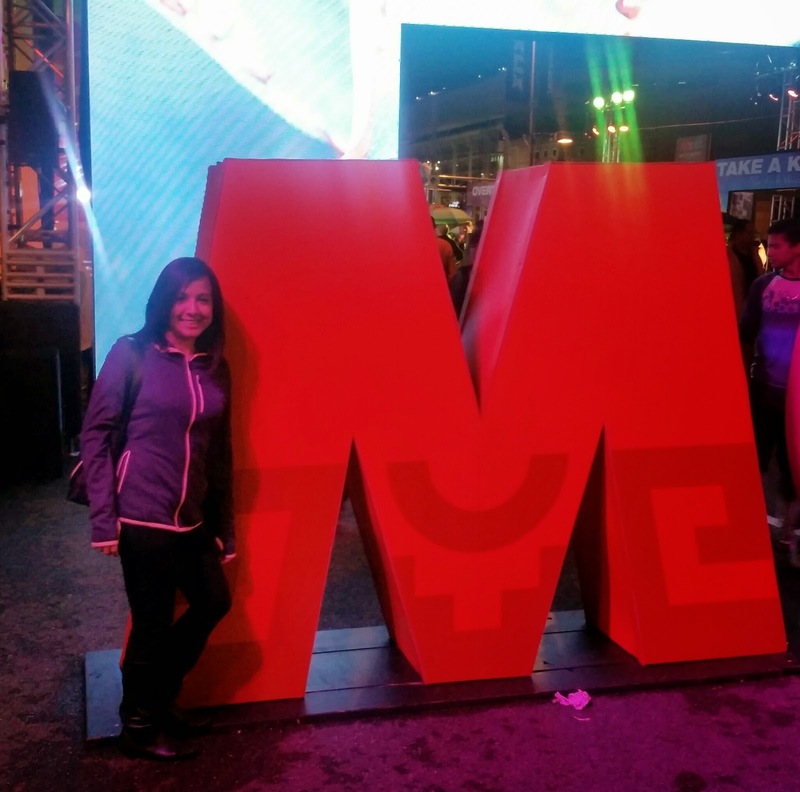 We walked toward the Visit Mexico experience, which had LED screens of Mexican landmarks, large M-E-X-I-C-O letters to take photos with, sand sculptures of more landmarks and a green-screen photo booth. You could also buy some Mexican food and margaritas, of course. We found the stage where the Roots would perform, but it took more than 15 minutes to get into the audience area. At various points our bodies were directly on strangers’, and many concertgoers resorted to pushing to get through. We considered leaving the entire Super Bowl Central but decided instead find the nearest restrooms. The portable toilets were located by Central and Washington. At this point, 7 p.m., the washing stations had run out of water, and the bathroom I entered was out of toilet paper. Good thing I had napkins in my purse. We wiped the soap off with a paper towel and walked back toward the concert stage. This time we managed to find a few feet of space to watch the show. We formed a “circle of trust” with a couple of Seahawks fans and a middle-age woman who was a huge Roots fan. The two Seattle fans were completely decked out in green and navy. Our plan was to not allow anyone to pass through us and invade our space. We succeeded for the most part, except for a few people who saw me and decided the short girl would be easy to push past. 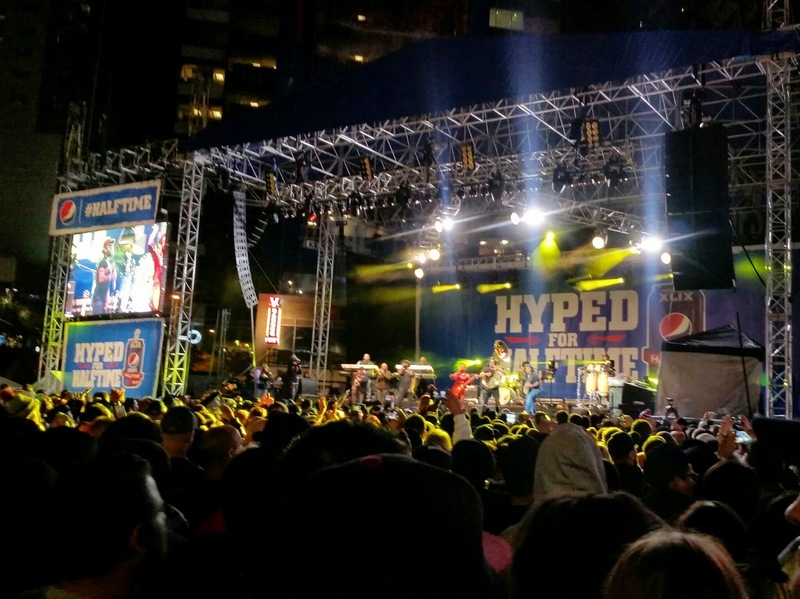 Within a few minutes, the Roots were on stage and the crowd became visibly more energized. The dancing began, the lights brightened and the music did not disappoint. At one point the Roots played “Jungle Boogie” — the crowd loved it. As Graham and I danced, I thought, “This was worth the effort.” They were as good as I remember them being when I went to “Late Night with Jimmy Fallon” in 2010. I couldn’t understand why, but the crowd thinned out toward the end of the show; we later found out people were no longer being let in. Anyone who left couldn’t return. After more dancing, we decided to slip out a few minutes early to beat the crowds who would be trying to leave soon. 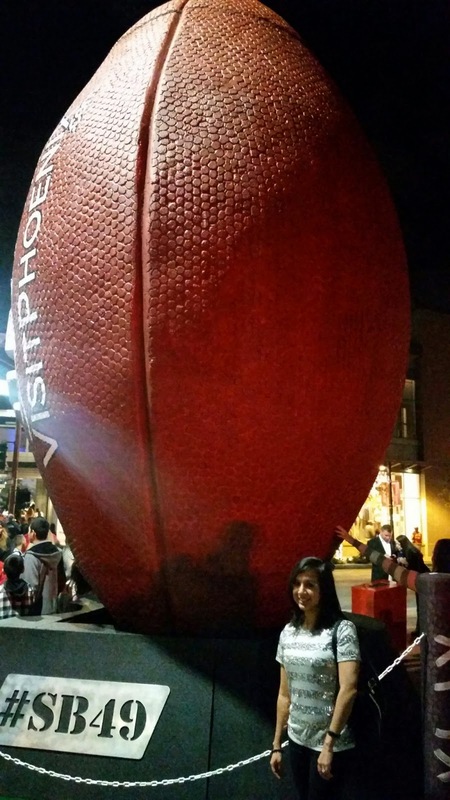 But we couldn’t leave before getting a photo with the giant football. Finally, it was time to wait for the next light-rail train. From the station we could hear the music from the nearby Tostitos stage; the “Cha-Cha Slide” was playing. A teenage girl in front of us took the opportunity to shoot a selfie video of her singing the lyrics and dancing. Many of the commuters, including Graham and me, also danced and sang. The train arrived shortly after. As its doors opened directly in front of us, I scrambled to find a seat and succeeded. My tired legs couldn’t take anymore standing or dancing. This final victory was the cherry on top of a fun evening of participating in the Super Bowl revelry.